Pizza is one of my favourite food and I love especially those that are super cheesy and crust that are crispy on the outside yet fluffy on the inside! Came to this outlet at Suntec for Christmas (26/12/13) celebration with my cell group. 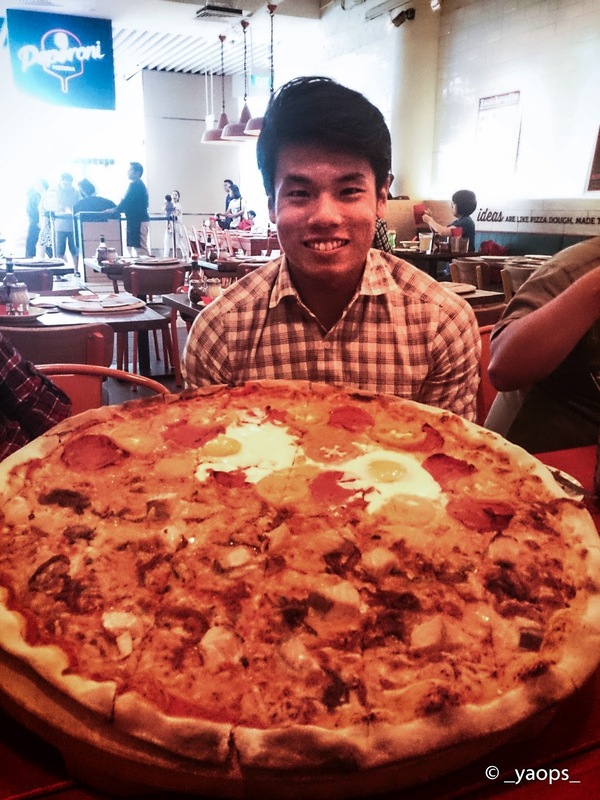 All I know about Peperoni Pizzeria is that they do serve their pizzas in XXL size (21 inches)!!! Definitely match my style of eating and not for the faint hearted! They also have many other food choices such as Entree dishes (appetizers), Pasta, Mains and Desserts. My friends did order other mains, but focused all my attention on the pizzas. We ordered 4 flavours (Salmone, Pancetta, Quattro Formaggi and Diavola) out of 15 choices. Well, not the best tasting thin crust pizza in my opinion, however it was still tasty enough and satisfying. This is definitely a place for group outing and foodie that loves Western food.